Find out what our clients think about their MOSSpods and working with MOSS design. “With an expanding family we realised an office space within the house was no longer an option. Not wanting to add a second extension to the house, we decided to go for a pod, which has turned out to be an exquisite treasure on our property. After initial contact with the team at Moss, we immediately felt confident that we were investing wisely – they are professional, knowledgeable, dedicated and simply great to work with. Moss were entirely open to our idea of building a pod on the hillside where an existing area of thorny hedgerow would first have to be cleared. We loved the fact that the team were so encouraging and they seemed to really enjoy the challenge that the landscape presented them. It was honestly a joy to have them around. 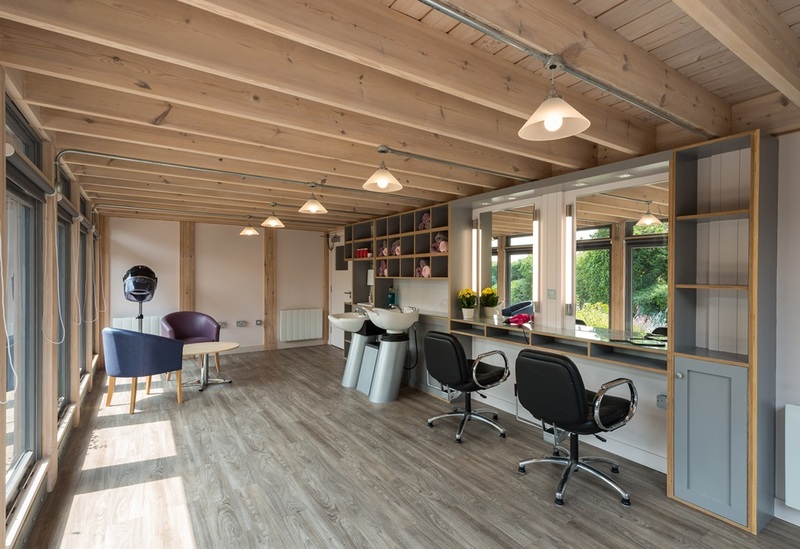 “Now that our hairdressing salon is up and going I want you to know how delighted we all are – mangers, staff and most important the residents love it. It’s been a pleasure having you design and build this and your personal touches to the design are lovely Lydia. “My own work history for some decades has been property and building related, so I confess I am a fussy customer. Throughout the project, each member of Jon and Lydia’s team responded to my queries very professionally. The drawings were excellent as I would have expected, the hundreds of components arrived on site perfectly co-ordinated, the construction team worked long hours and extraordinarily hard, and the attention to detail was truly impressive. Given that one 7m wall of my pod was totally bespoke it is hard to believe that the site held a garage on 1st December, and that by the time the team went home for Christmas on 18th December the partial demolition of the garage was completed, the steel frame and the pod build completed, including the electrics and tying in to the original building. 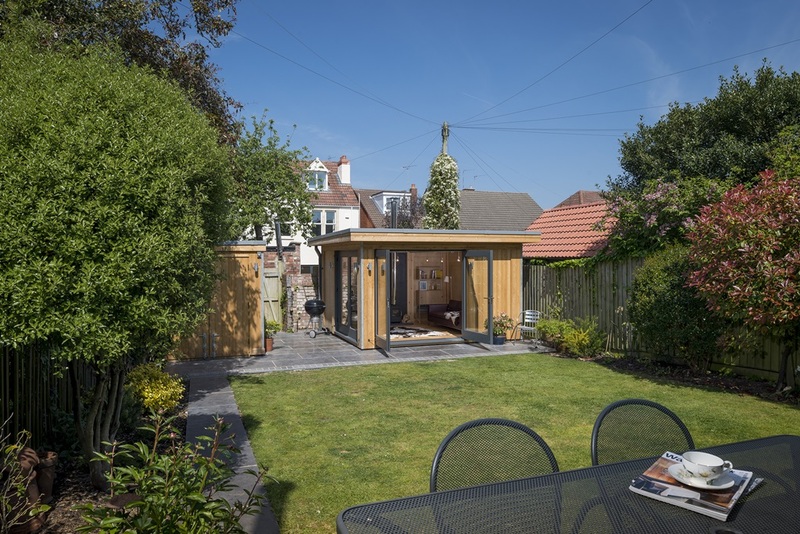 “I contacted MOSS to discuss options for constructing a pod in our garden which could be initially be used as an office for me and could subsequently evolve into a room for relaxation/escape as we start to think about retirement. 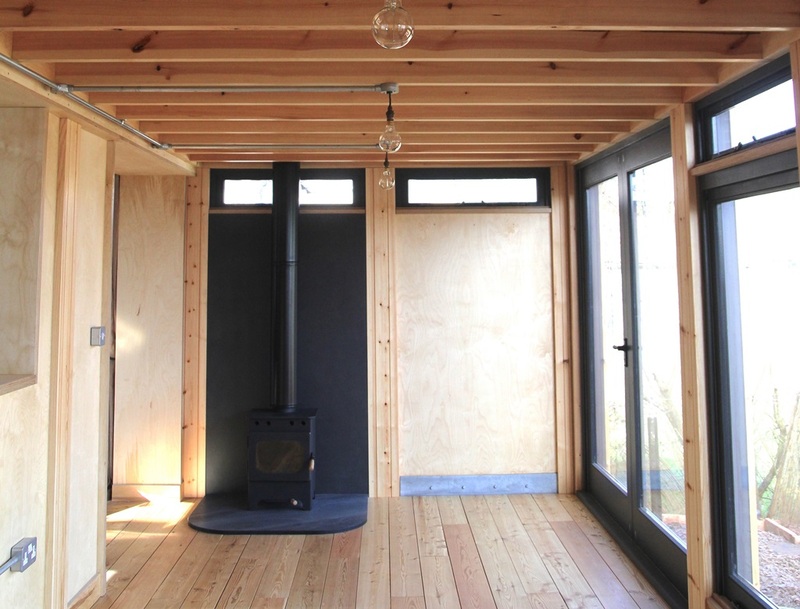 I didn’t want to compromise on design or comfort, and the finished pod has exceeded expectations. The whole process has been smooth, and the care and attention that has gone into both the design and the construction is impressive. 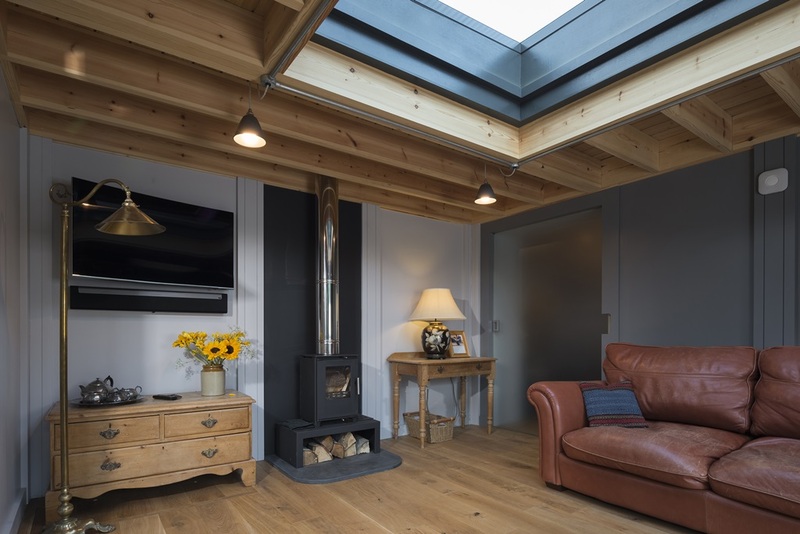 The addition of a woodburner and doors that can be opened up in the summer enables us to comfortably use the pod 365 days a year – it is a lovely place to be! “This was a well managed project, professionally executed and we have no hesitation in recommending MOSS Design and Build. Our site borders a preservation area, thus any construction is likely to raise concerns. Moss handled all the planning issues on our behalf. Their presentation was excellent, which no doubt helped the planning permission to be granted readily. Our site was challenging, requiring the removal of considerable amounts of soil and the building of a large section of reinforced walling. Moss undertook the whole contract, including this ground work. Despite careful planning and consultation, all projects seem to throw up the occasional “curved ball”. The way these problems are addressed during construction, is key to the overall client experience. Moss responded and adapted well to changes when and where necessary. No time was lost and they always seemed to be on top of the job. All staff did their work to the highest standards, including showing respect and consideration to us, our need for reasonable privacy and constant access to the property. None of our neighbours were unduly affected and we received no complaints, regarding noise or dust. Trades’ vehicles were sensibly parked at all times and deliveries were well organised, always with adequate staff on site to unload. Our project required many bespoke features, but these were installed with great care and skill. Where original features were replaced, the budget was fairly credited against unused materials, without question. 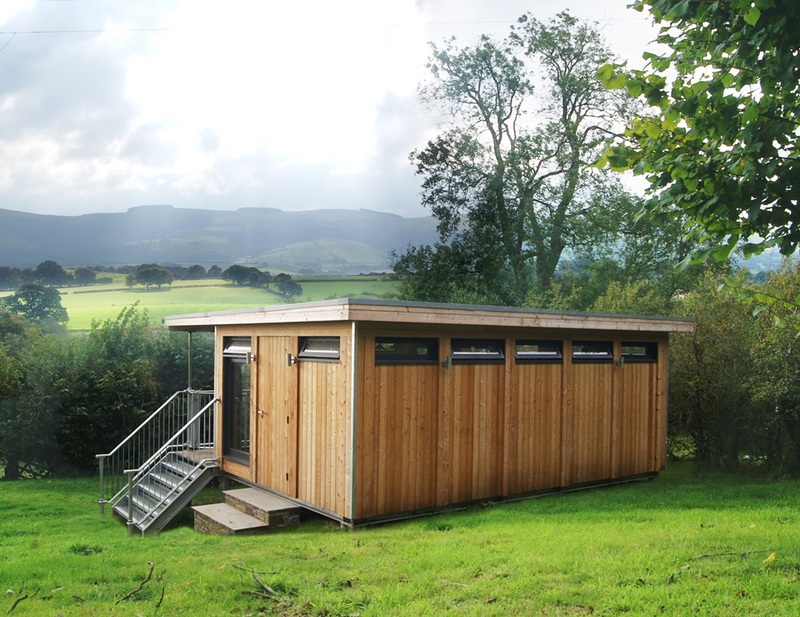 We have been very pleased to enjoy the garden and our new pod building throughout this summer of “hit and miss“ weather. The pod has given us extra enjoyment of the garden. Even in days of frequent and unpredictable showers and low summer temperatures, we have been able sit under cover with plenty of sunlight and fresh air. The building has both met and surpassed our expectations”.